Want to graze on the greener side? Then, Koramangala is a great place to be. Among the gazillion restaurants that dot the area, there are a handful of those who make reignite your love affair with vegetables. Here are Koramangala’s best vegetarian restaurants. One of the highlights at the archaic Raheja Arcade, Gramin specialises in North Indian cuisine and sports a charming, rustic look. Patrons especially love it cause it reminds them of ghar ka khana and the pocket-friendly prices wins votes too. The menu attractions are the crunchy Paneer Kurkure, the melt-in-your-mouth Gramin Kofte, and the Dahi Bhindi. Pair these up with their ghee-slathered rotis or pulaos and you’ve got yourself a delicious meal. 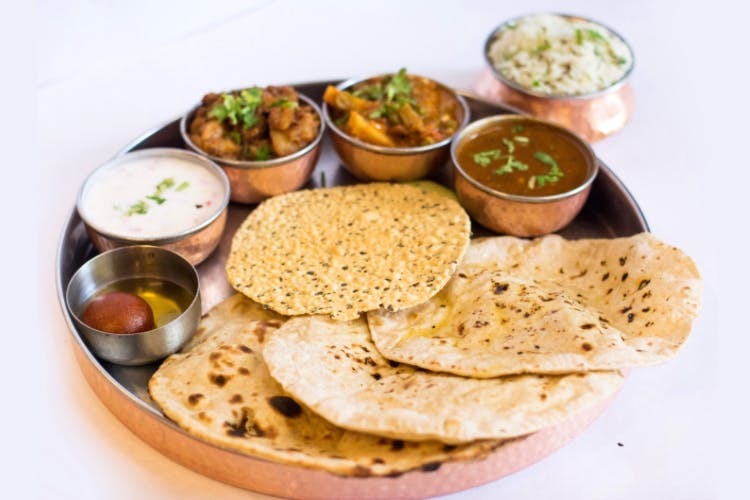 On weekdays, the place also serves a filling thali. Buzzing Sree Krishna Kafe does not disappoint no matter which meal you drop by for. In the early morning, you can kickstart your day with their hot, hot masala dosas (they’ve got quite a variety including baby corn and their fantastic podi versions) or their fluffy oothappams. At lunch, we highly recommend their banana-leaf meals. And for tea, their Rasa Vadai (Medu vadas dunked in tangy rasam) or their spicy Chilly Idly. The humble prices make this place all the more endearing. Neighbouring Gramin, Om Pure Veg sure does give the former plenty of tough competition. Veggie lovers can’t get enough of their unlimited thalis that come for less than INR 200. For that princely sum, you can wolf down helpings of dal, rice, rotis, and vegetables. Sweets, papads and other condiments make up the rest of the thali. If you prefer something light, they have an array of snacks (their sabudana vada is popular) or one pot meals like their creamy khichdi. Not just is Carrots veggie-friendly, you can go the whole hog and turn vegan here. Start off with their Soya Buttermilk and then nibble on Rosemary Potatoes or their Baked Papdi Chaat. For mains, there’s the Peri Peri Burger, featuring a patty made of potatoes, carrots, and beans. Or their delicious Mushroom Stroganoff. Finish up with their Chocolate Cream Cake or their Coconut Milk Pannacota. This no-frills joint is perfect for when you want to gorge on veggie delights despite your slim wallet. Come here for a quick meal and you can order up piping hot Aloo Parathas or their thalis that include rotis, rice, dal, and subzis. The eatery is popular for its lineup of chaats, kachoris, and its oh-so-delicious Malai Ghewar. For more, click here. This humble joint that doubles up as a sweet shop is a great place for a vegetarian, North Indian meal. You can tuck into Hara Bhara Kebabs, Paneer Kulchas and Kadi Pakodas here. They also have a handful of thalis you can pick from. Dropping by in the evenings? Then, try their long list of chaats that include Bhalla Papdi, Dahi Puri and Aloo Ki Tikkis. This popular joint does dhaba-style food with flair. Swing by and try their Palak Cheese Dumpling Kebabs and their Afghani Chaap. If you are craving ghar ka khana then go for the Rajma Chawal or, well, the Ghar di Thali (this comes with rotis, rice, daal and a vegetable). Their Amritsari Kulchas and Grilled Paneer Biryani are worth a try too. Vegetarianism goes hipster at Enerjuvate! Starting from brekkie, you can chomp on everything from chocolate pancakes to millet upma and poha. If you are coming by for lunch or dinner, do try their Ragi Flour Momos, Oven Roasted Nachos Platter (that comes with a vegan, cheese sauce), or their Pink Stir Fried Millets. Finish up with helpings of their Chocolate Chia Cup Pudding or their very popular Brownies that are made with ragi and almond flour. For the hungry, North Indian, this place is heaven! Fluffy Chole Bhatures and buttered-up Naans make an appearance here. You can also sign up for hearty Khichdi, Soya Pulao, and Paneer Malai Tikka. For your rotis, they have Pind Chole, Soya Masala Chaap, Aloo Mutter and Dal Tadka. Or you could simply settle for one of their thalis. The menu here celebrates healthy eating. If you are here for breakfast, then your choices include Oats Porridge, Chilas (crepes made chickpeas or moong dal), hash browns and parathas. The rest of the menu features dishes like Quinoa Tabbouleh, Kodo Millet Burger, Pasta Margarita, and Tofu Brown Rice. Need a quick yet delicious, vegetarian meal? Podi Idly is just the place for you! Their strictly South Indian menu is made of all-time favourites like Idlis, Ragi Dosa, Bisibele Bath and Onion Uthappams. Plus, a meal here costs close to nothing. Got parathas on your mind? Then, this delivery-only place is great company to keep! You can order up boxes of Sattu Paratha, Paneer Paratha, Gobi Paratha and Aloo Pyaz as well. They also serve up Paratha and Chole combos. If you want to give an extra zing to you dish, choose from a variety of pickles and chutneys. Another takeaway/delivery restaurant, this place, as the name suggests, is all about veganism. Their all-day breakfast options include Tofu Millet Masala Dosa, Whole Wheat Waffles, and Bran Muffins with Cashew Milk. For the main meals, you can enjoy Tofu Popcorn, Vegan Hot Dogs, Pro-biotic Pizzas and Burgers, and Tempeh Noodles.